Mondelez International newly spun company out of Kraft Food Inc has launched a new combination of two popular products Cadburys Dairy milk chocolate and Oreo cookies .It will be a milk chocolate bar containing a creamy filling with Oreo cookie pieces called Cadbury dairy milk with Oreo. 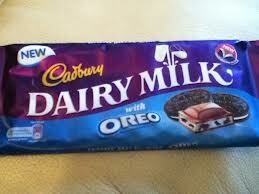 This new chocolate bar would be introduced in UK market from this week as per the news reports . Kraft food has been innovating products to increase its sales in competitive UK's biscuit market . Should be a winning combination for consumers .